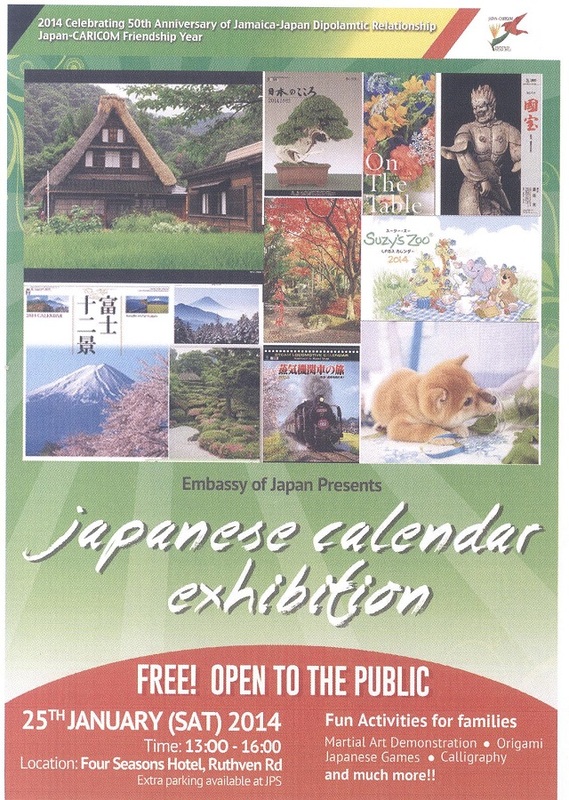 Its that time of year again when the Japanese Embassy in Jamaica hosts a Calendar Exhibition that allows Jamaicans an opportunity to learn about Japanese culture as well as score some beautiful 2014 calendars. 2014 is also a special year because it marks the 50th year of diplomatic relations between Jamaica and Japan. This event in many ways is the first of many events throughout the year that will celebrate the excellent relations between both counties. I missed last year’s event but there is no way I will be missing this one. Look out for me at the event this Saturday January 25th from 1pm to 4pm! I’ll be snapping pictures and will have a followup post with details of the event afterwards. Will you be there? leave a comment or tweet me @Jamaipanese so we can meet up! This sounds like an awesome event and I hope you enjoy it. Looking forward to your photos and your post.